Craftster Community > OCCASIONS AND HOLIDAYS > Halloween > Halloween Decor and Parties (Moderator: kittykill) > My Amazingly cheap Halloween Party decoration Tons of Pictures! Our first ever Halloween party was this last Saturday. We really had a super tight decoration budget (but an impressive amount of decorations on hand collected over the years) but wanted to show off our new house. So with alot of creative re purposing, and many many many trips to every dollar store witihin 30 miles my projects finally took shape-best of all I still have $2 from a $25 budget. The blackout curtains along the windows were cheap $1 trashbags unrolled trimmed on the bottom to make a nice flat doubled plastic rectangles layered to cover the entire window. 2 $1 shrouds added a curtain like detail when tacked up to top of window sill. The thick black drapes to the sides and swag on the top were 3 $1 plastic tablecoverings gathered and thumbtacked around window to frame it. The tablecloth was a queen fitted sheet (mine) with 2 more shroud clothes for texture. A black upholstered chair from my livingroom props up a skeleton we got on clearance 5 years ago. The orange was also a $1 table cover cut in half and draped to add some color. This shows the side view of the table-- a kitchen chair with some empty boxes draped with more trashbags made a nice platform for a tombstone. The buffet table had a spiderweb table runner from a few years ago and with the wrought iron candlestick from my kitchen and $1 worth of artistically dripped candles looked great but still too cheerful under the fruit painting. I really did not want to remove my everyday things when I could just make them spookier so I dug out one of last years projects- the death angels. The angels were originally a paper mache Christmas decoration my mom had had around for years. I had campaigned to throw them out several times and just when she agreed to pitch them I decided to remake them. Painting skulls over their angelic little faces and their wings black then draping the shrouds over them (inspired by mourning statues in cemeteries). They fit perfectly over the picture with the shrouds hanging down made the whole area work well together. 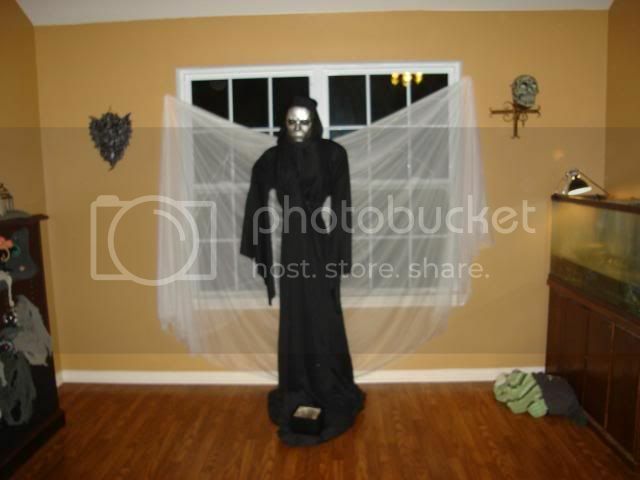 this overlooked the living room with a reaper made from pieces of several old Halloween costumes and the backdrop cut off a long roll of scene setter material from a party years ago. Feel free to ask any questions if you are curious as to how something was done-- I love questions! 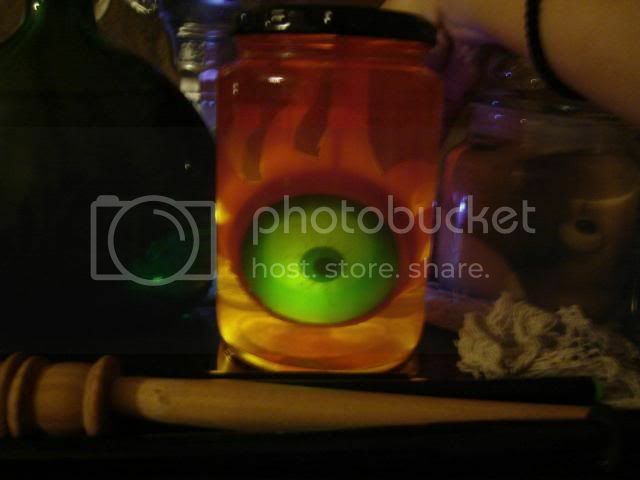 Re: My Amazingly cheap Halloween Party decoration Tons of Pictures! you have a really good imagination. good job of reuse/recycling. 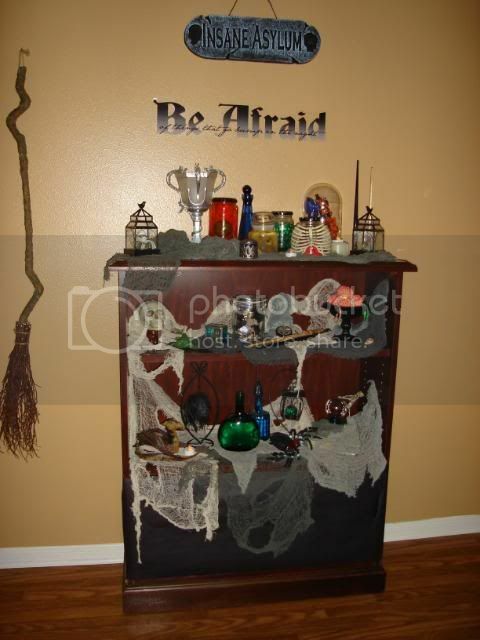 i love halloween but never did like spending alot of money decorating for it. i love the skeletons and the bookshelf area looks interesting! someday i would love to learn to make specimen jars. i have just one question, what would we do without the dollar stores? I feel the same way about the Dollar store that I do about the internet... I didn't ALWAYS have them and am not sure how I managed life before but I am sure it was empty and meaningless, but most of all boring. Amazing job! Proof again that you don't have to have an all-out budget to throw an all-out party!! Great job! Wowzers! That's just great! I also collect Halloween decorations year after year, utilizing sales, close-outs, thrift stores and the dollar store and this you've done an amazing job with all of it! I'd never had thought of using garbage bags instead of plastic table covers, but I bet you got so much more coverage for you dollar. I'd love to see more photos of your specimen jars (I'm starting to get a few of those put together and would love more ideas).